Kick cancer out of the world with nature’s best chemotherapy agent, sweetly known as Garlic. It is fêted as an ‘herb of passion’ for its power of influencing fortitude and natural energy levels and is celebrated as the most hopeful natural remedy for preventing cancer. Besides being called as the stinking rose with its pungent and not so pleasing aroma, Garlic has a long medicinal history in various traditions across the world and is also known as ‘cure-all’ for its ability to treat illnesses of the nervous system, circulatory system, digestive system, reproductive system and the respiratory system. Botanically called as Allium sativa, Garlic has its origin in India and its essential oil is extracted from the bulbs through steam distillation method. Known by the name Rasona, Lahsoon and Yavanesta in Sanskrit, Garlic and its essential oil are used in Ayurveda for the treatment of cancer, heart diseases, diabetes, cold, rheumatism, high blood pressure, parasites, impotency, skin disorders, digestive problems, mental disturbances, fluid retention and joint problems. Garlic is perceptibly a spectacular herb/vegetable with the human use of more than 7,000 years and is a member of the onion family, Allium. Indigenous to the central parts of Asia, Garlic is by far the most promising herbal remedy with the longest historical use. Its uses have been mentioned in various herbal guides by celebrated herbalists and physicians like Dioscorides, Galen, Hippocrates and Pliny the Elder, especially for treating digestive disorders, respiratory problems, wounds and low immune power. The ancient Hindu mythology states that Garlic is a sacred herb grown from the drop of nectar (Amirtham – Elixir of life) spilled on earth when Lord Garuda took away the pot of nectar from Lord Indra to save his mother from evil powers. It is still believed that because of the divine qualities of the nectar, Garlic has innumerable healing properties and was named as Rason, meaning King of Rasas (It is also said that Garlic has 5 out of 6 prominent tastes in Ayurveda). Another interesting historical reference is that Garlic was grown in the hanging gardens of Babylon and it was considered as an herb of empowerment for which it was given to Roman soldiers before the battle. The traditional European fishermen used to wear garlands made with Garlic cloves to guard themselves from sickness and evil spirits. Garlic was the most primitive herb used as a ‘performance uplifting’ agent and was given to the Olympic athletes in primordial Greece. It is also said that Garlic was used during the construction of the Giza pyramids before 5,800 years. It was also used in Nepal, Middle East and eastern parts of Asia for treating tuberculosis, bronchitis, rheumatism, fever, flatulence, colic, liver problems, intestinal worms, hypertension and digestive problems. It is a part of most of the delicious cuisines all over the world as a spice, condiment or seasoning for its strong aroma and the flavor it adds to any dish especially the non-vegetarian food varieties. Garlic bread, garlic chicken, crostini, garlic toast and many other Asian and Mediterranean cuisines are crowned with the rich flavor of this wonder herb. Garlic oil is known for its carminative, antibacterial, aphrodisiac, antioxidant, immune-booster, anticancer, antibiotic, expectorant, antispasmodic, disinfectant, anti-carcinogenic, antithrombotic, stimulant, anti-arthritic, antiviral, rejuvenative, anti-hyperlipidaemic and alterative properties. The major chemical components that contribute to the healing values of Garlic oil are selenium, allicin, alliin, phytoncide, S-allylcysteine thiacremonone, ajoene and diallyl polysulphides. Disease, aging and death are the three major causes of concern for mankind and have been attracting the attention of medical researchers, philosophers and heath care experts from all over the world since ages. Ayurveda, the holistic healing methodology aging about 5,000 years aims at attaining longevity through healthy aging and prevention of illnesses. This ancient remedial science strongly states that absolute health is a medley of physical, mental and spiritual well-being. This Vedic system strongly considers human body as a temple and relates the divine power with the soul that rests within. According to this philosophy all things on earth are a part of nature and are made up of the five vital elements of nature, namely earth, water, air, fire and ether. Every person is a unique creation with a unique individual constitution that embraces three vital biological energies called as doshas. These energies are just a meaningful representation of the elements of nature. Kapha dosha symbolizes earth and water and is in charge of the physical structure and sustenance of the body, the imbalance of which leads to obesity and respiratory problems. Vata dosha is a combination of air and ether and is responsible for circulation, movement and respiration and vata vitiation causes neurological disorders, nervous problems, breathing difficulties and menstrual difficulties. Fire and water combine together and represent Pitta dosha, which is responsible for body temperature, digestion and other metabolic functions. Lack or excess of pitta dosha might end up in fever, indigestion, constipation, heartburn, ulcer and other digestive disorders. Balance between these three doshas contributes to healthiness and imbalance of any one or all the three doshas cause illness. Ayurvedic remedies aim at treating the doshic imbalances with the help of herbs, plant essential oils, yoga, meditation, Ayurvedic routine, prayers and simple physical exercises. These remedies vary from individual to individual based upon their unique individual constitution and state of health. 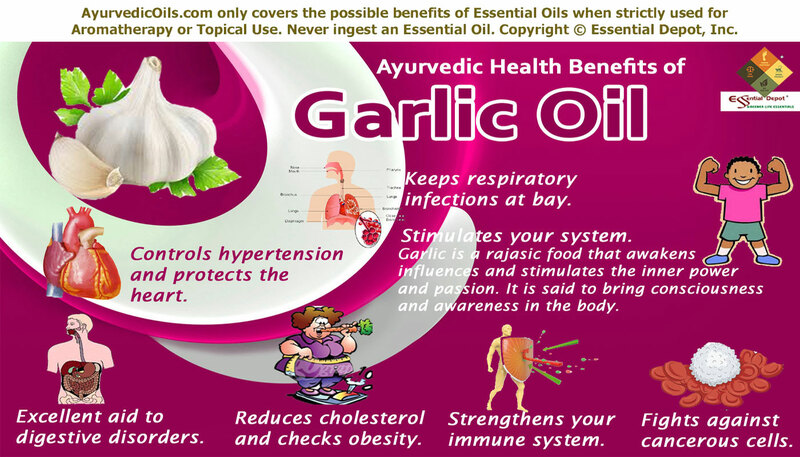 Garlic is one among the ancient Ayurvedic remedies for treating various health conditions and have been a vital part of numerous Ayurvedic preparations. The book on ‘Ayurveda and Aromatherapy’ by Bryan Miller and Light Miller quotes Garlic as a highly rejuvenative oil, especially for the nerve tissue. Garlic oil is good for increasing pitta dosha and lessening excess of vata and kapha energies. From Stone Age to this contemporary era, Garlic is a promising home remedy for assisting problems associated with digestion. 2 to 3 cloves of Garlic boiled in a cup of water can be a sure shot remedy for treating indigestion, sluggishness, diarrhea, nausea and gastric troubles. It is regarded as a great natural medicine for supporting digestion by stimulating the appetite and enhancing the process of metabolism. Imbalance or vitiation of pitta dosha is the major reason for digestive disorders. Garlic has the ability to increase pitta energy and regularizes Agni or the digestive fire and other metabolic functions. Adding 1 drop of Garlic oil to your handkerchief or tissue and inhaling this strong aroma or mixing 2 drops of this oil with 1 ml of coconut oil can help in fighting against intestinal parasites, inflammation in the stomach and intestines, treat colitis, infectious diseases, stomach upset, dysentery and food poisoning. This oil works effectively against food poisoning by combating harmful bacteria like Salmonella enteritidis and E.coli, which are responsible for food poisoning and other stomach infections. It acts by penetrating through the skin cells and entering the blood stream, where it passes on its remedial properties to the system. Garlic oil has anti-oxidant, anti-carcinogenic, antithrombotic and anti-cancer properties, which help in preventing the growth of new cancerous cells in the body and curtailing the growth of existing cancer cells in the body. Numerous researches and studies have proved the potent of Garlic and its extracts in treating various types of cancer ranging from brain cancer to prostate cancer. Garlic is first on the list of potential cancer-preventative foods by the American National Cancer Institute and the American Journal of Nutrition issued on October 2000 had published numerous epidemiologic studies stating that the people who used Garlic and its extracts regularly had only a lesser amount (1/3rd) of risk of colorectal cancer and not as much of risk of stomach cancer when compared to people who took little or no Garlic or its extracts. The presence of numerous (30+) powerful anti-cancer and antioxidant compounds in Garlic oil including ajoene, diallyl sulphide, quercetin and alliin have the power to wedge cancer creating agents like aflatoxin and nitrosamine associated with liver, lung and stomach cancer. These components work like a natural chemotherapy agent and have been proved in various studies for impeding the growth of malignant cancer cells. A 2008 study on the ‘Anticancer effects of diallyl trisulphide derived from Garlic’ suggest “diallyl trisulfide is responsible, at least in part, for the epidemiologically proven anticancer effect for garlic eaters.” It is also said that the diallyl sulphide in Garlic is known to curb the conversion of PhIP, which is a kind heterocyclic amine that has been related with the increased cause of breast cancer in women. The best ways to use Garlic for cancer prevention is to add 2 to 3 cloves of raw or cooked Garlic in your diet along with a soothing massage with 2 drops of Garlic oil blended with 1 ml of virgin olive oil for promising results. Garlic is a rich source of allicin and it controls the function of angiotensin II, which is a protein that aids the contracting of blood vessels thus increasing the blood pressure gradually. Along with this, the red blood cells in our body convert the polysulphides in Garlic into hydrogen sulphide, which expands the blood vessels and assists in controlling high blood pressure. Garlic oil acts as a protective shield for the heart by protecting it from hypertension, atherosclerosis, heart attacks and certain other cardiovascular problems. The sulfur-based compounds present in Garlic controls the blood vessels from being blocked and support the functioning of arteries that gradually lose its potent with age. This oil also guards the heart from the harmful damage of free radicals with its antioxidant properties. By this way, regular use of Garlic oil and Garlic cloves help in slowing down atherosclerosis (thickening of the arteries). This oil reduces platelet aggregation and relaxes the walls of the blood vessels by stimulating the production of nitric oxide. Inhaling the aroma of Garlic oil with 1 drop of this oil added to tissue or massaging your chest with 2 drops of Garlic oil blended with 1 ml of olive oil can assist in treating atherosclerosis, blocks in the blood vessels, heart attacks, high blood pressure and other cardiovascular disorders along with the strengthening of cardiac muscles. Cold, flu, cough and other respiratory infections are mainly due to the excess of kapha dosha. Garlic oil has the natural warmth in its essence and it lessens the excess of kapha energy. This oil also has antibiotic, expectorant, decongestant, antiviral and antibacterial properties that work together to curtail the growth of harmful micro-organisms that worsen respiratory infections. Add 2 drops of Garlic oil in steam inhalation and inhaling this healing aroma and massaging your chest with 1 drop of Garlic oil mixed with vaporub or ointments can be of great aid in treating and preventing common cold, whooping cough, asthma, chronic bronchitis and breathing difficulties. LDL (bad cholesterol) and lower serum triglycerides are the worst enemies of the human body. Garlic oil aids in maintaining HDL or the good healthy cholesterol and decreasing the level of bad cholesterol thus it lessens total cholesterol levels in the body, blood triglycerides and decreases the formation of arterial plaque. Along with this, Garlic oil also assists in controlling the formation of fat cells and helps in eliminating the excess deposits of water, salts, fat and other toxic substances contributing to obesity. It prevents weight gain with its anti-inflammatory property mainly due to the presence of 1, 2-DT (1, 2-vinyldithiin) in Garlic. Massaging your body with 5 drops of Garlic oil mixed with 3 ml of sesame oil aids in dissolving fat cells and discharging excess water and toxic deposits from the body by promoting frequent urination and sweating. This massaging can also be useful in reducing inflammation in case of arthritis and rheumatism. Garlic oil is an effective immune booster with the presence of various nutrients like vitamin C, B1, B2, B3, B5, B6 and B9 along with magnesium, iron, calcium, phosphorus, zinc, sodium, protein, potassium and carbohydrates, all of which make Garlic a potent powerhouse. The antioxidant property of this oil fights against aging symptoms and protects the body from the hazardous effects of free radicals. 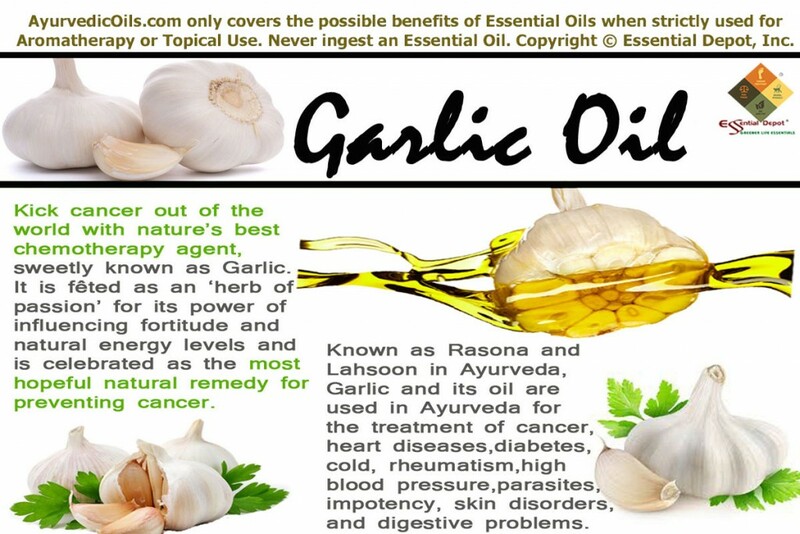 As a powerful antiviral, antifungal, antibiotic and antibacterial oil, Garlic has a positive effect on the immune system by acting as a police force that fights against destructive microbes and infectious diseases spread by them. Inhaling the spicy aroma of Garlic oil by adding 1 drop of this oil to your diffuser can help in activating the white blood cells and the immune system, through which it increases the body’s resisting capacity against various diseases. Garlic is a rajasic food that awakens, influences and stimulates the inner power and passion. It is said to bring consciousness and awareness in the body. It is for this property, Garlic and its essential oil is said to treat sexual disorders like impotency and other reproductive problems. Add 1 drop of Garlic oil in vaporizer or aromatic candles and inhale the aroma for enhancing the natural levels of energy in the body and to rekindle your spirit. Garlic oil is also an excellent remedy for treating pimples, blackheads, acne, athlete’s foot and wrinkles. It is also said to prevent scurvy, due to its high content of Vitamin C and beriberi with its power to enhance thiamin absorbing capacity in the body and reduce the level of blood sugar in diabetes mellitus patients. This information is only for the purpose of education and is not intended to diagnose or substitute any prescribed medication or professional medical advice. Never take essential oils internally and always remember using essential oils topically in a diluted form only, as pure and organic essential oils are highly concentrated substances and may cause harmful effects if used directly on the skin. Seek advice from an Ayurvedic professional before selecting the right essential oil for your state of health and unique individual constitution. This entry was posted in Essential Oils - Learn About and Purchase and tagged Allium sativa, Ayurvedic health benefits of Garlic oil, Ayurvedic oils for cancer, Ayurvedic oils for common cold, Ayurvedic oils for controlling cholesterol, Ayurvedic oils for digestive problems, Ayurvedic oils for heart attack, Ayurvedic oils for heart problems, Ayurvedic oils for high blood pressure, Ayurvedic oils for immune power, Ayurvedic oils for impotency, Ayurvedic oils for obesity, Ayurvedic oils for respiratory infections, Ayurvedic oils for rheumatism, Ayurvedic remedies for cancer prevention, Ayurvedic remedies for food poisoning, Ayurvedic remedies for weight loss, Ayurvedic uses of Garlic, Chemical constituents of Garlic oil, Garlic essential oil, Garlic in Ayurveda, Health benefits of Garlic oil, History of Garlic, Natural remedies to prevent cancer, Therapeutic properties of Garlic oil by AyurvedicOils. Bookmark the permalink.